African Spirit "Good Luck Charm". As it meant to many early cultures, raffia combined with other materials was used to denote something good, a type of good luck charm. 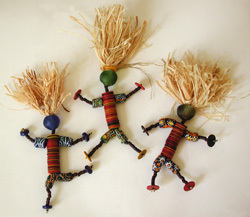 Raffia is still used today in many traditional African ceremonies to ask "gods" to bring good things.